How do cities reel in a mega event? Each November, the NFL issues a 200- to 300-page bid book to cities looking to host the game. Draft bids are due in April, and the NFL’s 32 owners vote on the location at an owners’ meeting sometime thereafter. These days, fans are also participating in the management of leagues and teams, from voting players into All-Star contests via Twitter and text messages to influencing business decisions by way of powerful online fan forums and in some cases being directly involved in the ownership of a team. How did the internet help fantasy sports evolve? In 2010, the estimated 29 million Americans who participated in fantasy football leagues, according to Liberty Media, helped the NFL achieve unprecedented television ratings across all of its broadcast platforms. A common denominator that transcends cultural and societal differences, sports are an enormous and growing business that delivers a massive and highly engaged audience game after game. Rick Horrow, America’s leading expert in sport business, and coauthor Karla Swatek give fans an inside look at the multibillion-dollar world of professional sport. Packed with information from industry insiders, Beyond the Scoreboard reveals the true movers and shakers while looking at the forces driving this lucrative business. Go behind the scenes with your insider’s access to the high-pressure, high-stakes business of professional sport. In Beyond the Scoreboard, Rick Horrow, sport business analyst for Fox Sports, Bloomberg TV, Bloomberg Businessweek, and the BBC and host of PBS Nightly Business Report’s “Beyond the $coreboard,” and Horrow Sports Ventures’ vice president Karla Swatek take you to the boardrooms, negotiating tables, and executive suites of sport’s most influential powerbrokers. the effect on teams and fans of revolutionary changes in modern ticket selling. Whether you are one of the millions of people who play fantasy sports or you just want to know more about how your favorite teams determine their strategies, you’ll learn how the experts make deals happen. And with engaging sidebars and exclusive interviews from the most powerful figures in sport, including Roger Goodell, David Stern, Brian France, and Gary Bettman, you’ll gain expert analysis from people who have played leadership roles in some of the most intense negotiations and lucrative business deals in sport history. There’s nobody better equipped to explain what it takes to be a success in sport marketing, sponsorships, facility financing, or generating media coverage than Rick Horrow, the Sports Professor. In Beyond the Scoreboard, Horrow and Swatek provide you with an all-access pass to the multibillion-dollar world of professional sport. Chapter 6. So You Wanna Own a Sport Team? Rick Horrow is the leading expert in the business of sport as the architect of over 100 deals worth more than $13 billion. The CEO of Horrow Sports Ventures (HSV) hosts “Beyond the $coreboard” on the Nightly Business Report and serves as a sport business analyst for Fox Sports, Bloomberg TV, Bloomberg Businessweek, and the BBC. As the leading commentator on sport business and as a well-connected entrepreneur, he has access to many of the top names in sport, including commissioners, owners, general managers, coaches, and athletes. His clients have included some of the biggest organizations and companies in the world of sport and business: NFL, MLB, NASCAR, PGA, Great White Shark Enterprises, Cisco Systems, Golden Bear International, Enterprise Rent-A-Car, LPGA, and MLS. Horrow is nicknamed the Sports Professor thanks to his time spent as a visiting expert on sport law at Harvard Law School. Karla Swatek is vice president of Horrow Sports Ventures. With Horrow, Swatek pens a weekly column on sport business for Bloomberg Businessweek. She has worked on book projects with Ken Blanchard, Peter Ueberroth, former USC football coach John Robinson, and Robert Hagstrom (The NASCAR Way), as well as business leaders like Anthony Smith (The Taboos of Leadership). 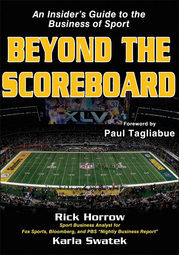 "Beyond the Scoreboard offers a behind-the-scenes look at professional sport. From players' contracts to event bidding, the book reveals the real components driving business and the hot-button topics of this high-stakes business." "Beyond the Scoreboard reveals the true movers and shakers in sports and examines the forces driving this lucrative business." "Few people I know have as much passion for the inner workings of the sport industry as Rick Horrow. In Beyond the Scoreboard, he gives fans a unique insider's view of the sports they love." Did the salary cap push the NFL to the brink of a canceled season?